ALBUM OF 8 PLATINUM PRINTS. 1884. EACH APPROXIMATELY 9 5/8 X 11 1/8IN. (24.4 X 28.2CM.) EACH MOUNTED ONE-PER-PAGE. TITLE AND DATE IN GILT ON FRONT COVER, BROWN LEATHER, G.E. WITH 2 PAINTINGS, POSSIBLY ON ALBUMEN PRINTS, ONE INSET IN FRONT COVER, THE OTHER IN ALBUM. THESE PHOTOGRAPHS ARE EARLY EXAMPLES OF THE PLATINUM PROCESS. 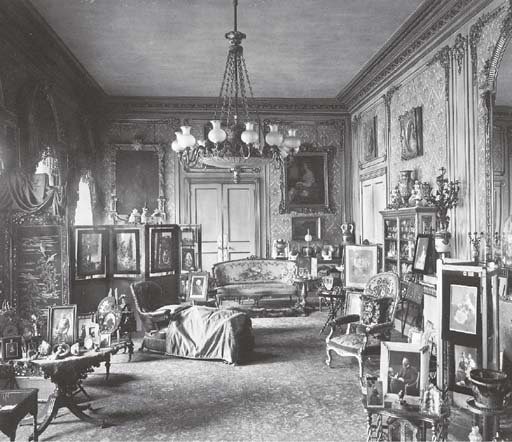 VIEWS INCLUDE DETAILED INTERIORS OF THE PRIVATE APARTMENTS AND TWO POSSIBLY HAND-COLOURED ALBUMEN PRINTS OF THE FRONT AND REAR FAçADES OF THE PALACE.